Hi guys! I’m Paola from Monterrey, México, FIRST OF ALL I need to apologize if my english is not well, but my first language is Spanish so I’ll do my best. 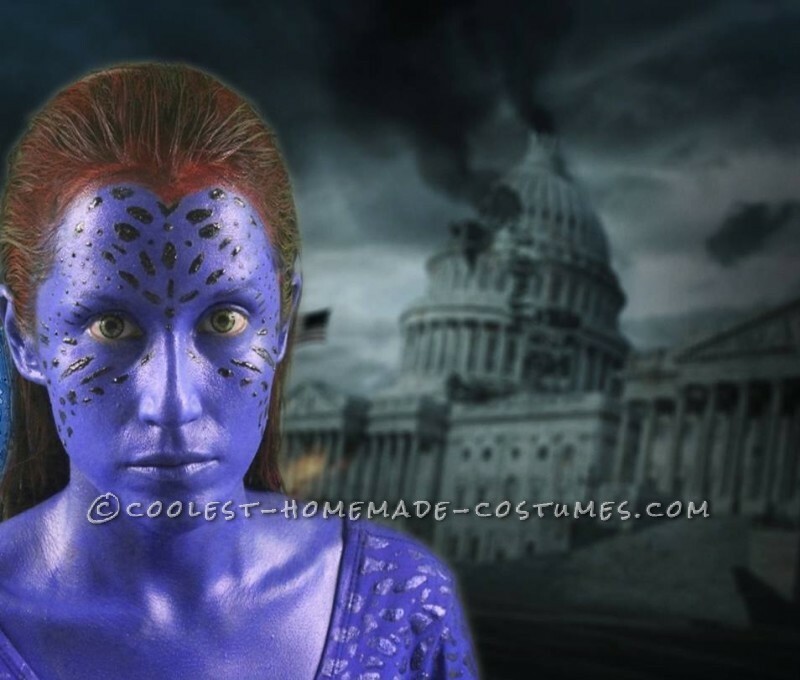 This year I decided to make myself a costume of MYSTIQUE!! Since 2009 I always wanted to be her because is my favorite character from X-men movies (i’m such a big fan), but I couldn’t use color contact lenses because of my myopia problem that has solved on December last year with a surgery. 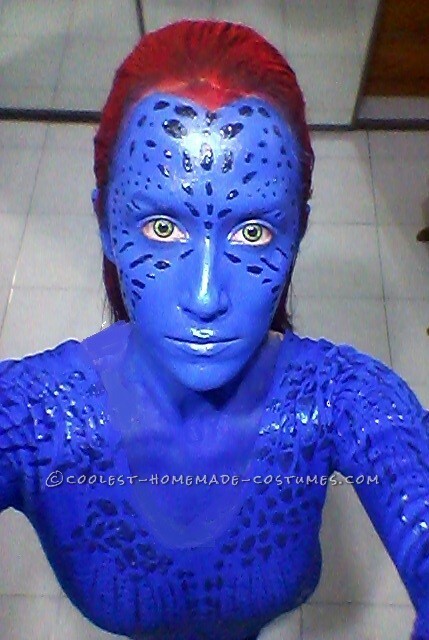 Well, this year (2014) I made my decision and finally made the costume! I started on mid-September when I bought a blue leotard on a store called “Caperucita” (about $15 dlls) and blue tights from Forever 21 ($5 dlls). 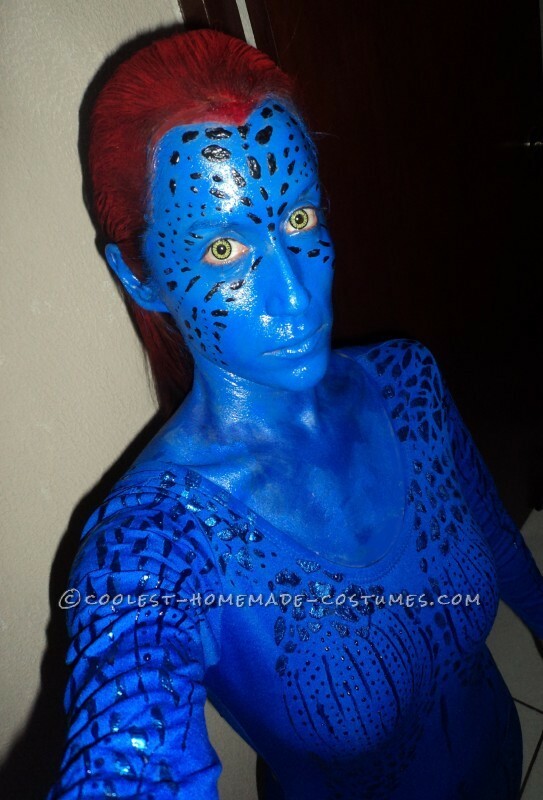 Then I started to paint both things with blue fabric paint, I saw Mystique pictures to follow the patron of the scales and it was so easy. The hardest part was the drying. For the leotard I painted one side (it took me about 20 minutes) and waited one day to paint the other side (another 20 minutes and one day for the drying). After drying, to make a more effect of the scales I painted them with blue nail polish. For the tights I did the same, and I dont know why but the drying was so much faster so I spent 20 minutes to paint them and another 20 minutes for the drying (I need to say that I was using them while I was painting) and that was how my costume was ready, all I needed was to wait to October 31st to make the rest. The next day I prepared myself again and I went to a night club (called Casa San Pedro here in Monterrey, México) with my friends. I was the sensation of the night, everyone wanted pictures with me, everyone wanted to talk with me, and everyone loved my costume. I was so happy!! 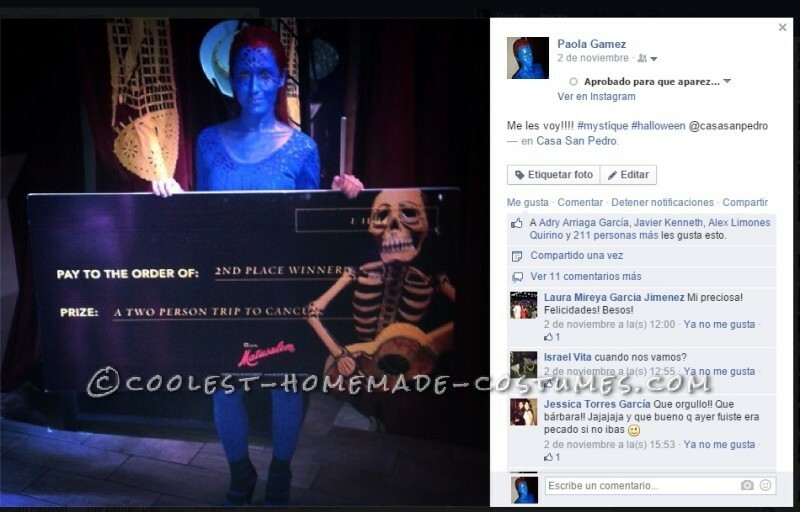 Then on the same place, I won a trip to Cancun for 2 persons because of a Costume Contest!!! My night was incredible and OMG I still feel the excitement of that moment. IT WAS THE BEST! 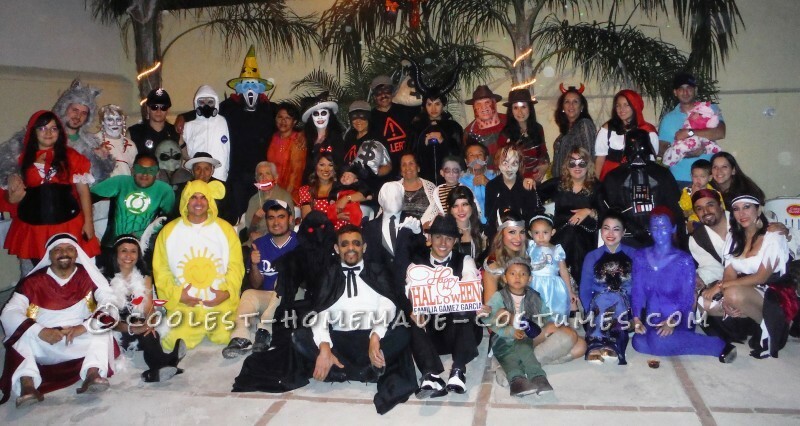 Homemade costume idea posted by Paola G.